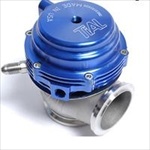 TiAl's original 38mm, 2-bolt wastegate. This design has proven to be one of the most reliable 38mm wastegates ever. Available in several different colors and spring pressures. (standard spring - 1bar). Other pressures are available, for questions please contact us at Sales@Stevebilt.com. 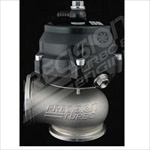 With over 60 years of combined turbocharger development and racing experience, Precision Turbo has taken great pride in providing you with the best external wastegate on the market today. 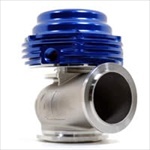 The Precision Turbo PW39 is made from high grade, high temperature stainless steel and billet aluminum components. It features Precision Turbo's own purpose designed Kevlar reinforced wastegate diaphragm and a 347 stainless investment cast valve body. Precision Turbo's investment cast valve body has a smooth internal surface, giving you better flow and more accurate boost control. The Precision Turbo PW39 was designed to be a direct replacement for other existing 38mm wastegate flanges, but will work best with the flange provided. The PW39 features a Nickel Chromium Alloy valve and 5 different 17-7 precipitation hardened springs. Also included are stainless steel inlet and outlet flanges with clamps. With a satin black anodized, 6061 aluminum billet wastegate cap you will have years of good looks and protection from the elements. The PW39 is generally compatible with most aftermarket manual and electronic boost controllers on the market today. 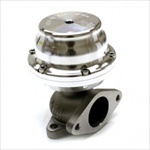 These Precision Turbo 46mm Wastegate units feature a 46mm valve, and can be used in a wide variety of applications. Precision Turbo Wastegates can be used in any kit or setup that currently utilizes a v-band style 44mm gate (Tial 44mm or Synapse 50mm), but will work best with the supplied inlet flange (the inside diameter of our flange is slightly larger than our competitors). Precision Turbo wastegates will be shipped with all the necessary hardware (flanges, clamps, springs, etc), and can accommodate a wide range of boost pressures (anywhere from 1.5PSI up to 25.5PSI). All units feature a black, anodized wastegate cap, and a Kevlar reinforced silicone diaphragm. In addition, the unit features a five angle valve job, as well as high temp 17-7 ph springs (more durable and can withstand higher temperatures before changing rate). Lastly, the Precision PW46 is set up for a 1 3/4" pipe on the discharge side, and a 1 7/8" pipe on the inlet.